A hankering for helmets and a craving for knee pads? Have you a hunger for hip-checks and have always dreamed of decking a fool? If you’ve a wanting for wheels and are cruisin’ for a bruising’ then head on down to our first open recruitment sessions of 2019 where you can get your fix on all this and SO MUCH MORE*! Absolutely no experience is necessary. Veteran A team skater and all-round boss coach May K Fist will take you through the basics of skating, before moving on to rules and roller derby game play. 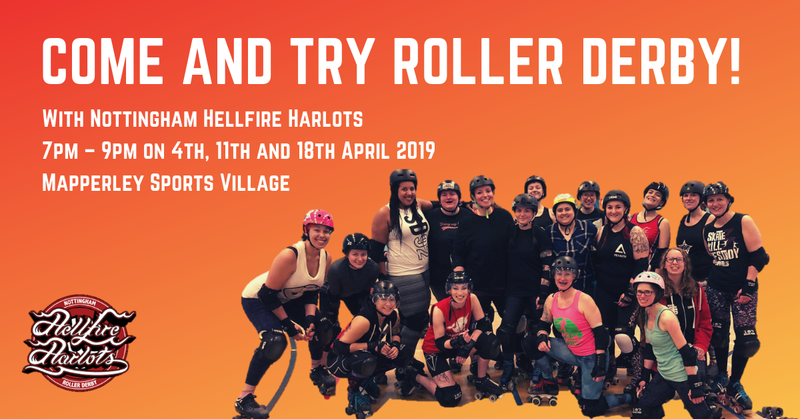 If you would like to read about what learning to play roller derby with Nottingham Hellfire Harlots is like, take a look at Vamp Vengeance’s blog post. Sessions are priced at £5 and kit can be hired for an additional £1. Please email sparks@hellfire-harlots.co.uk to register your interest and book kit. We do require skaters to purchase and wear a mouth guard. Prices can range from a few pounds to £80 for a custom dental fit. We recommend wearing comfortable clothing that you can move in, things can get a little sweaty! Try to arrive 15 minutes early to sign waivers and get kitted up. **Our league is aligned with the Women’s Flat Track Derby Associations rules, as a member league. This means that our skaters can be anyone who identifies as female or non-binary. If you identify as male, you can still get involved as a ref or NSO. Full details on the WFTDA’s gender policy can be found here.